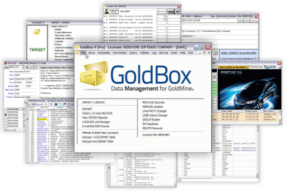 Manage Your CRM Data Your Way with the World’s Best Add-on for GoldMine®, – The All New GoldBox 9. GoldBox is all about Automation—helping streamline most any task you need to perform with your CRM data. Several versions to choose from, each with Value that far exceeds its price. Maintenance/support options available as well. Double-click any field in Source List displays value. Ideal for coded/auto-generated field names (i.e. FLD0057) as guide to accurate mapping. Map indicators at Source List now switchable with push-pin bar above list box. When off, mapping occurs faster (no repositioning of Target List fields). Source field now displays up to 3 indicators: default mapping, secondary field mapping, usage in field replace expression. Self-document Field Mapping Template. Every Target List entry for new and existing setups contains editable 250-character Comment displayed along bottom. Perfect for describing user-defined fields, customized Detail fields or any entry where field label is too brief to indicate actual usage. Query-by-Entry now allows user to select or key in one or more fields used by the ORDER BY clause in SQL for sorting result. Improved LookupDesc() function. If a GoldMine Lookup List is created for ORDER BY field selection, LookupDesc() returns a comma-separated value if user chooses more than one field. 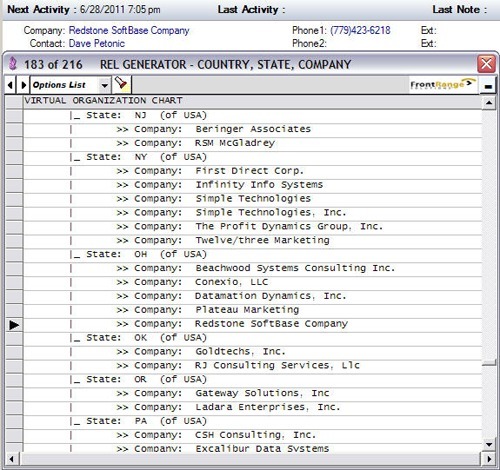 Ideal to display plain-language field descriptions atop a GoldBox Viewform Report, for example. This module now stays open after processing and can also be minimized. Perfect for a large number of repetitive conversions. All were brightened (gray to white) and clarified for less clutter, easier viewing. 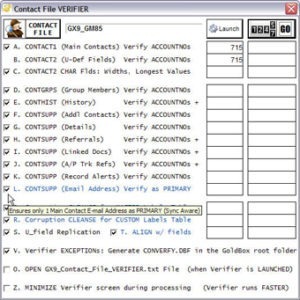 Contact File Verifier – U_field discrepancies were falsely indicated when the original field length is wider than the U_field counterpart. For example, the COMPANY field might be 55 length while the U_COMPANY field might be 40 in length. When procedure completed, an error displayed if NO GoldMine records were handled. Did not affect the actual processing. Green pyramid used by GoldBox 7 gone forever, replaced by newly-designed GoldBox logo. Icons for GoldBox Views changed from colored pyramids to highly-polished gems. Every Import/Update is different. GoldBox adjusts to YOUR unique implementation of GoldMine. 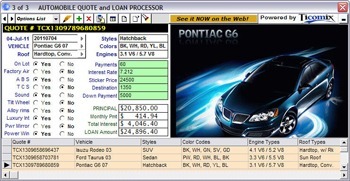 Features include pure alpha-numeric ACCOUNTNO field generation, live mapping Flags, Date auto-formatting, Double-field Mapping, options for field Translation, Source fields Write-Back, Plug-in of Tab records to a new or existing Main Contact, instant Field/Expression Result display and more. The full power of Structured Query Language (SQL) is available for record matching and field replace. Combine SQL with return-values from GoldBox’s 250-plus library of functions for SQL Query merge-fields, table filters and field replace expressions. It didn’t happen overnight. 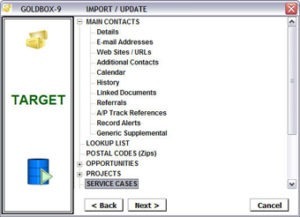 Today’s best CRM Import/Update found inside the GoldBox product line results from engineering efforts which began in 1993. Make the difficult task of data integration as painless as possible. Put GoldBox through its paces for automating the vital flow of data into your GoldMine system! Fail-safe dupe deletion for GoldMine began with GoldBox in 1993, boilerplating the tough standards for this sophisticated database operation. Previewing is a key for dupe detection and the COUNT Mode delivers. 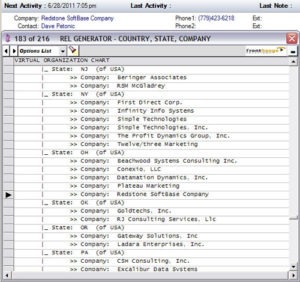 You can analyze identified dupes before any changes are made to your GoldMine data. That’s critical – because a Merge-Purge can only be backed out with a restore from backup. Since BATCH Mode is automated, GoldBox provides audit and control features to make it as failsafe as possible. Each Main Contact field can be coded with one of 5 Backfill options. Field differences can be written to History. 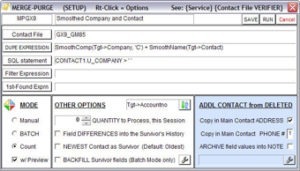 And, an Additional Contact of the *Deleted* record is ALWAYS created and appended to the Survivor, with an option to track the original field values of the entire deleted Main Contact. Outputting sets of GoldMine data and any ODBC-accessible data on your system has never been easier. Migrating targeted sections of your GoldMine business information to other formats and programs can be a challenge. Especially when it’s recurring – when you need to script and automate these types of operations. GoldBox puts you into the center seat for Exporting data with its point-and-shoot technology. The scripting of Data Management operations upon your business data is icing on the cake with GoldBox’s unprecedented Q-file logic. The deep analytical work in GoldBox is mostly expended upon the design of your data management processes. Once you’re ready to automate? It’s a breeze. You simply pick out the events with Saved Setups from a master list and that’s it. Changing the order of the event processing is as easy as spinning up (or down) the Event Sorter. GoldBox Views are $75 + $15 1st year Maintenance PER SEAT. Note: Pricing is based on the number of people you want to have access to the GoldBox View does not need to match your GoldMine license count. In GoldMine, your Detail record is viewable across several Tab choices, presenting a real challenge to see everything at a glance. 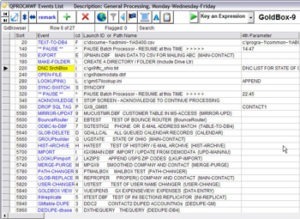 You can energize record display and data entry in a GoldBox View like this first Detail pictured above. Also, remove History, Email Messages and Attachments from GoldMine’s ACTIVE tables, then View the Archived data directly from GoldMine. Additionally, preview auto-generated Charts on-the-fly, then send to GoldMine’s Relationship Tab. For details about the following features please contact us. A: GoldBox is an “add-on” software product developed to augment the GoldMine® CRM system. GoldMine® began as a Contact Manager more than 2 decades ago, and today leads the field as an award-winning, full-featured CRM system. Q: When did GoldBox get started? 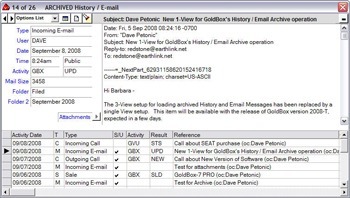 A: As GoldMine’s very first software add-on product, the initial GoldBox sale was recorded on April 8th, 1993. Since its inception, GoldBox has received three prestigious award from FrontRange Solutions: Best Add-on Product, Special Recognition and Lifetime Achievement Award. Q: Who uses the GoldBox product? A: GoldBox is used by businesses as diverse as insurance companies, banks, colleges, professional sports franchises, churches, software companies, retail stores, restaurants—literally any organization using a product such as GoldMine to track and manage contacts. Q: What is GoldBox’s primary functionality? A: GoldBox shines at gritty “under-the-hood” processing, operations that work directly and globally upon data tables. Capabilities include Import/Update, Export, Dupe Prevention, Merge-Purge of main record Duplicates, Global Record Delete, Global Field Replace, Process Scripting and Automation. Q: Will GoldBox run in a 64-bit environment? A: GoldBox is a 32-bit app and, therefore, we do NOT offer support for it in a 64-bit environment. As far as whether or not it will successfully run in a 64-bit environment, many experiences have been problematic. It is not recommended. Q: Will GoldBox work with Unicode fields? 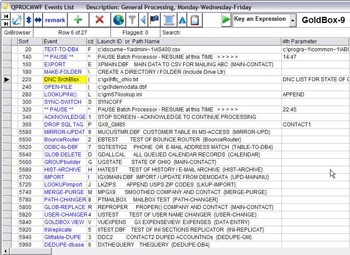 A: GoldBox does NOT write to Unicode fields in an MSSQL table. 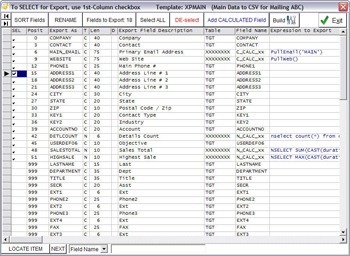 Typically you don’t need to setup GoldMine tables with the field types NVARCHAR, NTEXT or NCHAR, so this is not a primary concern. It is actually the BDE Administrator that does not recognize these relatively newer Unicode field types. Q: What other parent products does GoldBox handle? 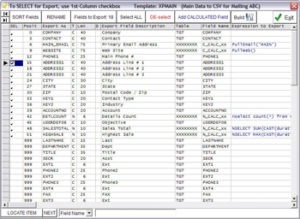 A: Technically, GoldBox for GoldMine can manipulate data in other systems, especially in the areas of basic import and update, export, table dedupe. That process is rather involved. Currently, GoldBox’s primary usage is to manipulate GoldMine’s data model specifically. Future products may address other systems because the next iteration of GoldBox-type product has been completely redesigned for generic functionality upon data tables. PLEASE NOTE: The FREE Edition of GoldBox needs to be installed prior to purchasing a software license. Upon purchase of any GoldBox version, a license key will be issued to unlock all features for that particular version. No additional installation will be necessary. The first year of maintenance is required for all new purchases. After year one, maintenance is optional. Please note that e-mail and phone support, as well as any updates and/or fixes are only available with active Maintenance. E-mail & Phone Support: Get responses to general support inquiries via e-mail or phone. For emails, we suggest you start at the GoldBox Help menu so that it automatically includes your serial number and GoldBox version. These are required for accurate tracking at Ticomix. We want to get a reply back to you as quickly and accurately as possible; therefore we ask that you be brief in your inquiry and cover just a single issue each time. Updates & Fixes: Get updates to GoldBox 9 to tweak existing features for usability or fix known issues. Because GoldBox involves extensive custom implementation, your maintenance fee does not cover GoldBox consulting, implementation or training. These items are separate and always fee-based. If you need assistance, please contact First Direct Corp.